Each ViewIn-enabled Chesterton seal is equipped with Radio-frequency identification (RFID) tags that can be read using a Bluetooth-connected RFID reader. Industrial seal specialist, A.W. 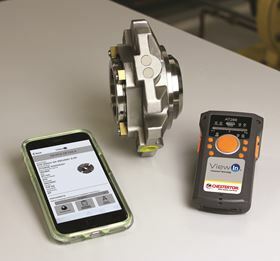 Chesterton Company, has recently announced the introduction of its latest mechanical seal product, the Chesterton ViewIn Technology, which facilitates seal identification and maintenance. The ViewIn Technology does this by providing wireless seal identification and recordkeeping via a mobile app. Each ViewIn-enabled Chesterton seal is equipped with Radio-frequency identification (RFID) tags that can be read using a Bluetooth-connected RFID reader. The RFID reader can then retrieve pertinent seal information, sealing device drawings, pressure test reports, materials of construction, and supplementary items. The new technology initially became available from 1 October 2018 with Chesterton’s S10 and S20 Cassette Seals. The ViewIn web/mobile application can be downloaded free from the Apple Store or Google Play. For more information visit the Chesterton ViewIn website. Fluid sealing specialist AW Chesterton Co has officially opened its expanded facilities in Groveland, Massachusetts, USA.